Quite likely while driving along East Jefferson, you have seen this large building. Perhaps you wondered a bit about it since it has no windows. Maybe you thought that it is a warehouse except there is usually a large American flag flying in front of it. There is no large sign to identify its owner or purpose. It is, in fact, a racquet club and, presumably, one of a small number of such racquet clubs in the North America. The game of racquets was, apparently, invented in London's prisons in the Eighteenth Century. Incrcerated men with time on their hands developed a game which involved hitting a small ball against a wall or a pair of adjoining walls. Gradually, the game became popular in London among those outside prisons. And, as is typically in the history of sports, formal rules were developed and facilities were standardized. I believe that, today, an official racquets court is 9.1 in width, 18.3 meters in length and 9.1 meters in heighth. A players used a 30.5 inch wooden racket called a bat to stroke a white ball that is, I think, 1.5 inches in diameter. The walls of the court are ordinarily painted a dark color to contast with the white ball. I do not know the full rules. The sport of raquects has close relatives, namely squash and the more recently developed racquetball. You will have to consult with someone who knows much more about the history of ball sports to get a full explanation of how these sports differ. After Detroit became an industrial metropolis in the late Nineteenth Century, a substantial number of office buildings were constructed downtown where an increasingly large number of white collar workers held jobs. 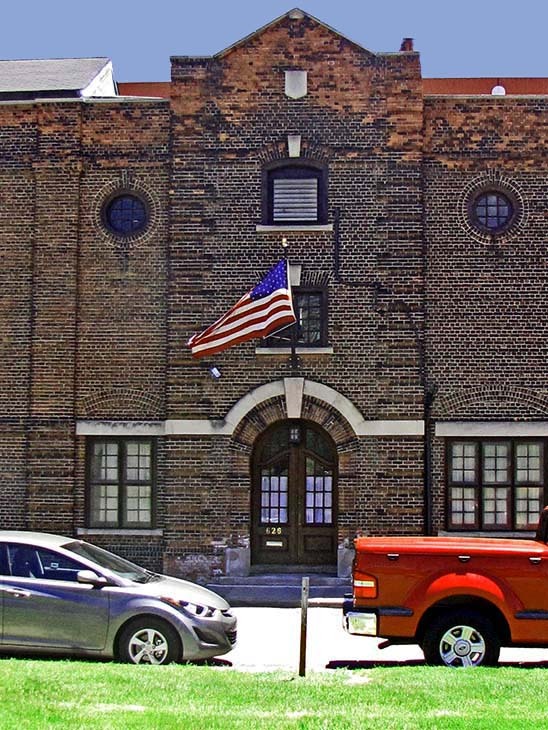 At this time, a number of men’s clubs developed and prospered such as the Detroit Athletic Club with their impressive Albert Kahn building behind Comerica Park’s center field and the Detroit Club with its marvelous Wilson Eyre designed building on Cass at Fort. Apparently, there were enough men interested in playing racquets that they not only formed a club, but had the resources to commission Albert Kahn to design the large brick building that you see. I believe that this is the second oldest racquets club in the United States country. Detroit is the home of the oldest rowing club in the country, the Detroit Boat Club on Belle Isle. Racquets, I believe, never became an extremely popular sport. And I think that is currently only played in England, Canada and the United States. The building you see is one of only five with official racquests courts in North America. The others are located in Boston, Chicago, Montreal, New York, Tuxedo Park and Philadelphia. Detroit once had the distinction of being the only city in North American with racquets courts in two building. The now razed University Club nearby on East Jefferson also had an official racquets court. Squash, I believe, was somewhat more popular among college-educated men along the East Coast. I am not quite sure how the Detroit Racquet Club survived. I read that, at one point after World War II, some or all of the racquets courts in this building were converted to volley ball courts. In the last decade or so, General Motors, Blue Cross-Blue Shield, Quicken Loans and other firms moved many employees into downtown Detroit within walking distance of the Detroit Racquet Club. With the arrival of more high level executive and professional jobs in downtown Detroit, a new interest apparently emerged in the ball sports played on indoor courts. I can image that some of the young graduates coming from the Ivy League colleges to Detroit were familiar with squash and could quickly learn to enjoy racquets. Apparently there are courts in this large Albert Kahn building that are used for hardball squash. This is, architecturally, an interesting building with an appealing entry way and some excellent brick work. I wonder why it is not listed on an historical register? However, it is not the peak achievement of Albert Kahn. That may be the Clements Library on the campus of the University of Michigan in Ann Arbor.